An outdoor wedding in Florida thru custom wood doors. May 28, 2016. This shot is truly a favorite way to showcase the incredible details that our couple had on display for their outdoor wedding ceremony at Quail Creek Plantation in Okeechobee, Florida. Wedding detail shots take on a whole new meaning when the entire scene before us has this much. Talk about a target rich environment. Not only the cool wooden doors , bales of hay, antique lanterns, wedding lowers and such, but this bridal ceremony actually took place on an old dirt road that is completely covered by huge oak trees with hanging moss for most amazing and detailed wedding shot ever! Backing up a bit from the typical perspective gave us this fantastic wedding ceremony shot looking thru the doors at our bride and groom at their ceremonial arch in the background for a truly unique look. Of course this shot also was delivered to our couple in monochrome. This much detail always is a favorite in black and white. 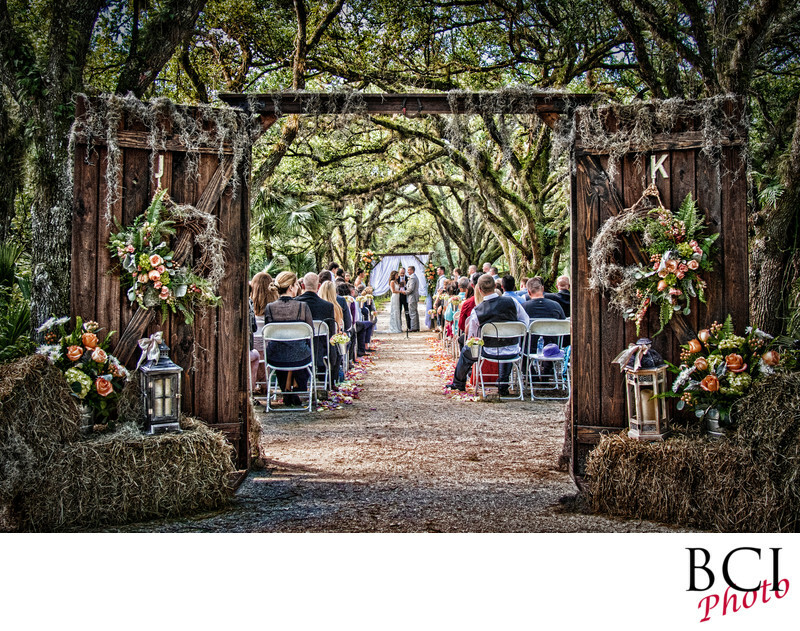 Even in our custom chocolate brown tone, the country feel of this wedding simply exudes old florida charm.